You are here: Home / Distribution Channels / Trade Shows for Software & Technology Firms – Do They Still Make Sense? Trade Shows for Software & Technology Firms – Do They Still Make Sense? Let’s talk about what for a lot of folks is a marketing method from a bygone era: The Trade show, or Trade Fair as they’re referred to in most places outside of the US. Does a Tech Trade Show Still Pay Back for Software Hardware Companies? At one point in time, Trade Shows were a staple in most every tech company’s marketing budget–shows like Comdex, PC Expo, Network World and a host of others were annual rites of passage. But in the Internet age, they have been greatly reduced as a percentage of the marketing mix, if not taken completely out of the picture. There are many reasons for this. First and foremost, the ROI of trade shows was always very questionable for most exhibitors. In marketing departments everywhere there were always sharp discussions during budget time on whether to continue the huge expense of the major shows. They always seemed important to exhibit at, but usually it was pretty difficult to make a direct correlation to enough actual revenue to justify the large expense. As the Internet became more prominent this ROI looked even worse in comparison–as it did for many other “offline” marketing methods, such as traditional direct mail and print advertising. So are trade shows now obsolete, having gone the way of the Dodo bird? Maybe not, but many marketing folks would say that they are at least on the endangered species list. So when, if at all, do traditional trade shows or trade fairs still make sense today? And what should your strategy and goals be, if you do decide to invest in a show or two? Let’s take a quick look at 4 points relevant to each of these two questions. One of the major enduring useful tactics in marketing is to “zig when your competitors zag”. If you are in a market where a particular trade show is still well attended by prospects, but vendors are starting to stay home rather than pay for booths – you may have a real opportunity. If your competitors aren’t there, you have a larger, captive audience of prospects to strut your stuff to. One of the basic tenets of a good marketing program is to find a “communications channel” which isn’t so crowded that the ROI goes to hell. With trade shows falling out of favor in marketing budgets, there is potential to benefit from a contrarian approach in some market segments. This is always one of the strongest reasons to attend a few shows. If you have a brand new company or your company is entering a market space it hasn’t previously participated in, a couple of well-selected shows can be a very good investment. Remember, you only get one chance to make a first impression. Much like a company entering a new market, a new product introduction is a very traditional reason to exhibit at a trade show. In my opinion, introducing new products at shows has historically been over-rated as a useful marketing tactic. Sure, the press is there covering the show but if 50 other vendors are also announcing new products your new product might get lost. Or at least get less press coverage then if you announced two weeks before or after the show. Remember the comment above about lower ROI with over-crowded communications channel? In some cases, announcing a new product at a show fits this description. This can still be a sound marketing tactic–just don’t do it because everyone always does it that way. Do careful research and planning to ensure that building your product introduction around a show is a net positive. If you have a product that absolutely requires some hands-on or personal selling before prospects buy, trade shows can be an excellent investment. For example, shows can be very useful if your product is quite expensive, or an expert demo sells far better than prospect downloads from your website. I had a software company client who was in a market where expert demos are essential; they grew the company to a great degree with trade shows and almost always could demonstrate a profitable ROI on their show budgets. This is always one of the most important reasons to go to many shows. If it is an important show, the press will be there in full force. You really need to plan PR tactics ahead of time, however, as all of the other smart exhibitors have the same goal of getting press appointments and coverage. It is CRITICAL to plan far ahead in securing appointments with target editors and have a “tease” of substantial news to obtain the appointment. Editor’s schedules fill up far in advance at major shows. Properly planned, the show can pay for itself just in this area by eliminating the need for a dedicated press tour. But if not well planned, you will end up “wasting” your product introduction or other news, resulting in little or no press coverage. Networking with the other exhibitors is often overlooked by many vendors. The focus is generally solely on customers and possibly distribution channels. However, often many companies with complementary offerings are attending and exhibiting along with a few of your competitors. This can be a great arena to begin or continue discussions with potential strategic partners. It’s best to set up appointments ahead of the show. But at a minimum, makes sure to set aside some time to walk the show floor and see who might have synergy with your company. Even if you’re pressed for time, shake a few hands and gather some business cards–it can be an excellent setup for future discussions. This is also an area that holds potential to lift your show budget’s ROI, which is often overlooked by many exhibitors. You are flying staff to a faraway city–why not go in a couple of days early and call on a few potential major customers? 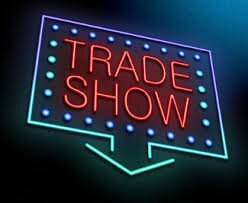 At a minimum, make sure you get those free show tickets that often go to waste out to the local prospects in your database, so they can come to the show for a meeting or demo at your booth. In the same vein as visits to end user customers it makes a lot of sense to call on current or potential channel partners, once you decide you’ll be spending money going to a show in a certain region. Add a couple of days to your trip and visit a few key partners and prospective partners in the area. And again, make sure to invite them to the show well in advance and supply those free exhibit tickets, so you end up seeing many more later at your booth. If you simply spend a lot of money and fly to a city, set up your booth, and wait for new customers to flock by to see you–you are likely to be very disappointed in your trade show return on investment. But if you use a trade show as a hub for a variety of related activities, adding a couple of key shows into your marketing mix can still bring a very nice ROI. The key is preparation and planning, to make sure your results are optimized. I’ve outlined a few reasons why it still may make sense to exhibit at trade shows/trade fairs even today, along with some ways to maximize your return. What’s your reason for attending trade shows in the online age? And what concrete results do you hope to achieve? Post a comment to expand this discussion. Trade Shows are important, but not as important as the promoters would have you believe. They can be worthwhile for those in Tech, but for most ultimate consumers/customers, of no relevance. Also for Techs there are more cost effective ways to grow a business or learn about new gadgets, but that does not negate the value of the shows for networking and getting noticed in a more immediate way. With fuel costs being what they are, we will see more Virtual Shows. Trade Shows are important to small and large firms in terms of making an impacting presence within the software community that you are both a competitor and an innovator. All other side benefits from Trade Shows from grabbing a potential distributor/retailer’s attention to getting press coverage outside of the trade event should not be looked at as the premiere reason for a firm’s participation. As mentioned above, virtual webcasts, podcasts, and other broadband based mediums of promotion have taken the forefront in grabbing exposure on a more immediate level that trade shows can’t provide. Consider sponsoring a smaller (more intimate) event – no more than 250 attendees in total. The larger trade shows make no sense. Why pay thousands of dollars for a booth and compete with all of the other vendors who will also be exhibiting? A good majority of the corporations (many of which are customers) go to events for the sole purpose of learning and networking with their peers. They are not interested in seeing demos and being bogged down with vendor based literature. Bottomline, you’re better off investing resources to host your own events! Take back control and develop your own panel content to attract the corporations you want as customers. I’ve always found the most effective approach for trade shows is to have the smallest booth, be in multiple partner booths and to have a suite at a nearby hotel for private meetings and demos for prospective customers. Marc, that’s been a pretty good approach for me as well. It’s been so easy, especially since the rise of Social Media, to say that Trade Shows and Conferences are on the way out. And yet, other than the inevitable dip during recessions, the results show the opposite. For all that is gained through the virtual, web based, and social media worlds — ultimately, people prefer face to face for serious relationship building. You can buy a cheap piece of equipment without ever meeting the manufacturer or distributor, but when it gets to enterprise level systems, equipment, and software — face to face is necessary.